Winter may be the baseball offseason, but St. Louis Cardinals fans can still get their baseball fix in mid-January. That's when the team hosts its annual Winter Warm-Up fan event in downtown St. Louis. The Winter Warm-Up is a great place for fans to meet their favorite players, get autographs, and learn all about the team. The Cardinals Winter Warm-Up is held every January over the three-day Martin Luther King, Jr. holiday weekend. The Cardinals Care Winter Warm-Up 2019 will run from Saturday, January 19 through Monday, January 21. The event is held in Downtown St. Louis at the Hyatt Regency St. Louis at the Arch. 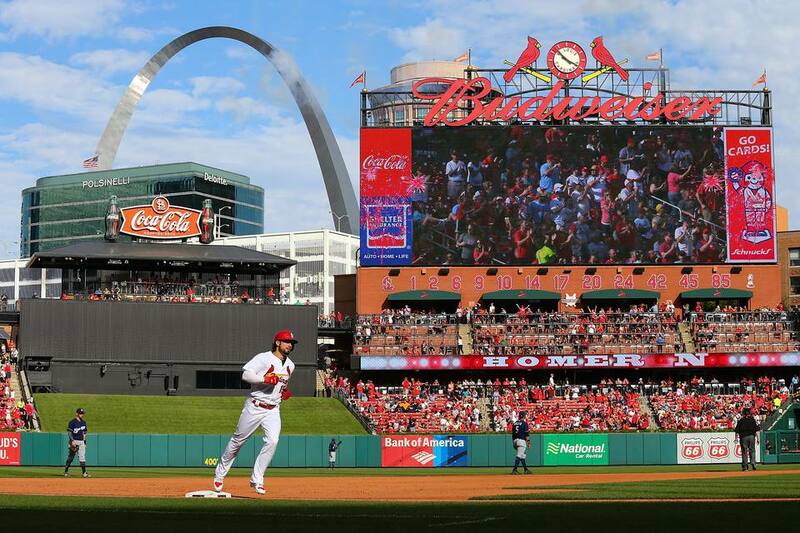 The hotel is located at 315 Chestnut Street, just a few blocks from Busch Stadium. Entry passes can be purchased online, by phone at (314) 345-9000, or at the Cardinals Team Store at Busch Stadium or Cardinals Clubhouse Stores at Union Station, The St. Louis Galleria, St. Louis Outlet Mall, St. Clair Square, South County Center, Mid Rivers Mall, and West County Center. There is plenty for fans to do at the Winter Warm-Up, but the big draw for most is the chance to meet and get autographs from their favorite players. Current team members, former players and Hall-of-Famers will all be on hand to meet fans. Some players will sign autographs for free, but for the others, fans must buy a ticket to attend the autograph sessions. Money raised goes to Cardinals Care, the team's charity to help local children. Those scheduled to sign autographs on Saturday include Trevor Rosenthal, Alex Reyes and Jedd Gyorko. Sunday's schedule features Carlos Martinez, Randal Grichuk, Aledmys Diaz, Stephen Piscotty and Kolten Wong. On Monday, fans can meet Jhonny Peralta, Matt Carpenter, Mike Leake and Mike Matheny. For more information on autograph session times and prices, see the complete schedule on the Cardinals website. In addition to the autograph sessions, there's much more for fans to do at the Winter Warm-Up. Fans can buy special souvenirs, bid on memorabilia at several auctions, meet Fredbird and attend live Q&A sessions with players, broadcasters, and team officials. Children can also play games and watch live entertainment in the Kids Room. Parking can be tricky in Downtown St. Louis, but the Winter Warm-Up is held over a January weekend making it easier to find parking than at many other events. Good public parking options near the Hyatt Regency are the Stadium East Garage at 200 South Broadway and the parking lots along the St. Louis Riverfront on the east side of the Gateway Arch. For more ideas, see Where to Park Near Busch Stadium. Another option is to take Metrolink to Busch Stadium, 8th and Pine, or Laclede's Landing and make a short walk to the hotel.